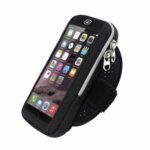 This ultra-light weight, durable running belt is perfectly designed for holding your phone, key and cash. The waterproof and breathable nylon material will keep your body cool, ensuring better exercise experience for you. 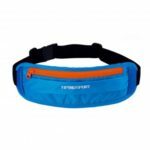 It will not bounce or chafe during long run or intense workout. The reflective patches allows you to run more safely at night. Not only durable, but also light and compact for your comfortable wear. Breathable material and honeycomb design can keep your body cool. No bouncing, no chafing and no clutter. 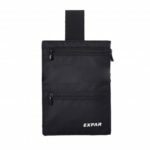 Waterproof nylon material and zipper keeps your valuables safety, protecting them from sweat, rain, and dirt. 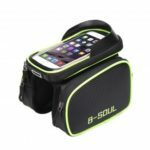 With one main pouch with double zippered compartment, it is perfect for phone, key, cash and earphones. The main pouch (size: 18 x 11 cm) can hold phones with screen smaller than 6 inch and protect it from being scratched. And the hole for earphones enables you to enjoy music while doing exercises. Reflective material will form a visible strip on the front pocket for better activity at day or night; zipper in the front design to enable easy reach to the phone during running. 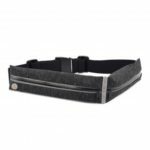 With special earphones hole in the belt for pleasant and relaxed workout experience.